Brazilian President Jair Bolsonaro will sit for formal bilateral talks with Trump on Tuesday, followed by a joint news conference, that will illustrate what White House officials hope is a budding partnership between the Western hemisphere’s two largest economies. For now, it’s a camaraderie based more in shared tactics, populist rhetoric and flattery than any particular issue, though officials said trade, security issues and the ongoing crisis in Venezuela are on the agenda for talks. Brazil also hopes to see itself elevated to “major non-NATO ally” status by the Trump administration, a major step that could help it purchase military equipment. The most closely watched dynamic will be the interpersonal relationship of the two men, who have spoken on the phone but not yet met in person. 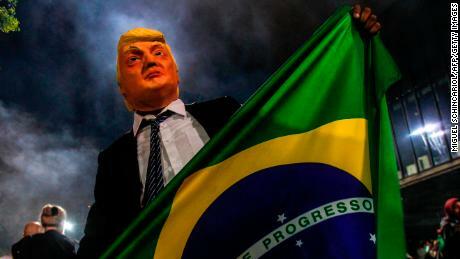 Trump phoned Bolsonaro within hours of him being declared the winner of October’s election, during which he espoused loud pro-America — and pro-Trump — views. That’s something of a rarity in Latin America or anywhere else in the world. Trump took notice, according to the senior administration official who briefed reporters ahead of the visit. “That has caught the President’s attention,” the official said. In addition to his praise of the President, Bolsonaro has adopted some of the President’s online habits, including on Twitter. He’s derided negative media coverage as “fake news.” And he’s shared the President’s combative attitude toward China. The two men have also both taken advice from Steve Bannon, the former White House senior adviser who broke with Trump after leaving the White House in 2017. Bannon had dinner with Bolsonaro in Washington on this week as part of a larger embassy event. Trump has not repaired his relationship with Bannon after a bitter split, people familiar with the two men say. His visit to Washington will be Bolsonaro’s first overseas bilateral visit, an honor White House officials say illustrates the new president’s commitment to fostering US ties. That’s a change from the past. “Even the friendliest of Brazilian governments was never that friendly,” the official said. The two will work to create a “north-south axis” between the US and Brazil on economic issues as the two largest economies in the western hemisphere, the official said. That also includes steps that would allow US commercial space launches from a site in Brazil and increased trade between the two countries. The US also hopes to rely on Brazil’s still-existent relationship with the Venezuelan military to apply pressure on leader Nicolas Maduro to relinquish power.